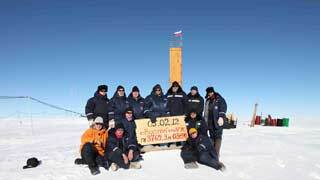 Official end of the "South Pole Station Modernization" project (31 March). This date was originally picked to coincide with the end of the RPSC contract, which of course had since been extended to 31 March 2012. First winter since 2006 with new 300 Club members. 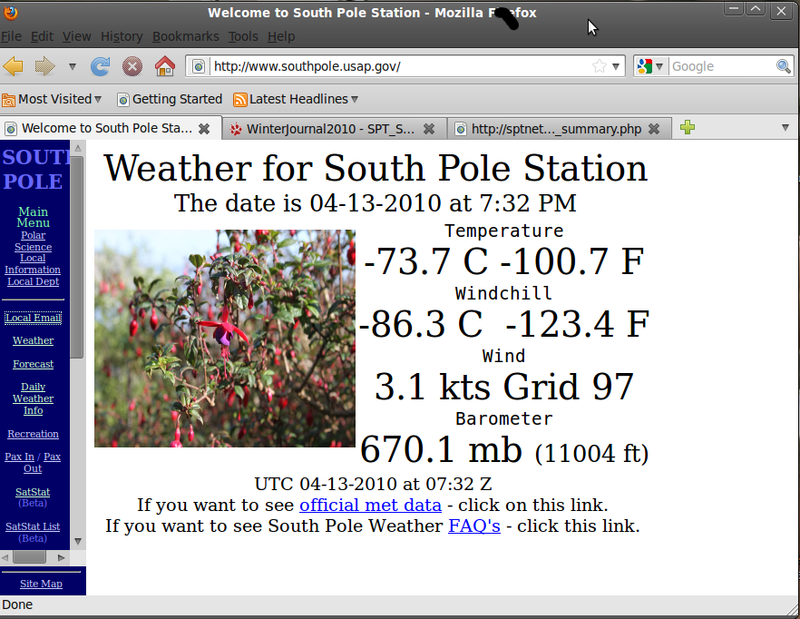 In 2007 the temperature dipped into 3 digits but too briefly for the sauna to get heated up. And in 2008 and 2009 it never got cold enough. But this winter saw the first triple digit temperatures for, well, 22 minutes, as documented here. For those who missed that opportunity, the thermometer dipped to -103°F on 5 July, staying in triple digits for about eight hours. 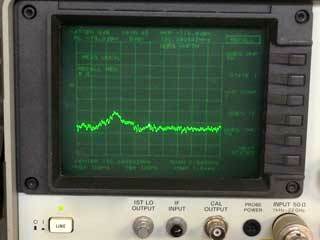 Historic Pole online amateur radio exam produces 8 new hams. Back in the pre-satcom days, ham radio was the only way Polies could talk to the folks back home. But now there is still interest, and after a bit of admin difficulty, volunteer examiner Ernie Gray W1MRQ administered the online exam in the large conference room on 29 October. The result: Eight new Technician licensees! 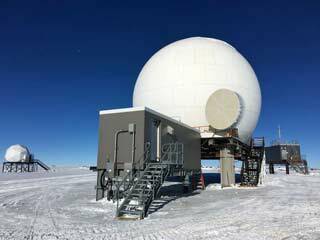 Here's the Antarctic Sun article with the details (and the names and new call signs). 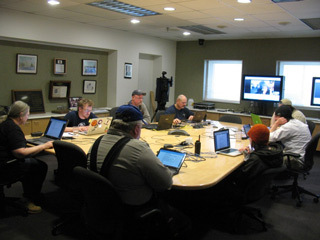 The event was facilitated by the ARRL, here's their news article and link to Ernie's photo of the event, seen at left. 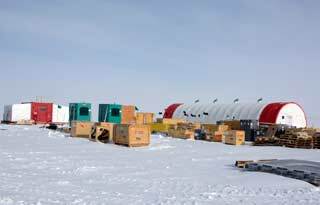 ALE relocates their main camp to Union Glacier (43 miles northwest of Patriot Hills), with a new blue ice runway (Explorersweb news article). Altie Meadows sewer line freezeup creates lots of work for the UTs and makes summer camp life, er, difficult (it would never be fixed, as summer camp was being phased out). 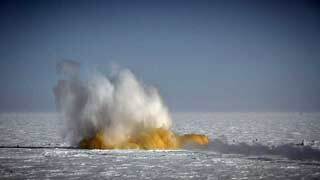 Tragic French helicopter crash kills 4. 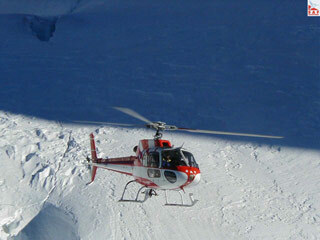 The Squirrel helicopter (file photo, left) had four men aboard, flying south from the French resupply vessel L'Astrolabe to Dumont d'Urville, when a distress beacon was detected late Thursday evening, 28 October 2010. The crash occurred on the sea ice 65 miles north of the French station (more information and credits). Hercs in McM had been held on standby for a possible medevac of survivors. Multiple rubber-tired expeditions travel to Pole. The first of three to arrive from Novo was the scientific expedition from Indian National Centre for Antarctic and Ocean Research (NCAOR)...8 members of the group showed up on 21 November in three of the Toyota Hilux AT44 vehicles which had been modified by Arctic Trucks of Iceland. This was almost certainly the earliest overland arrival at Pole in history. 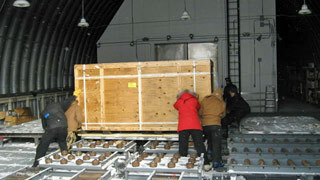 The second was the Kazakhstan National Geographic Society (KNGS) with 4 men and 2 vehicles, showed up on 5 December. The third was the ski race...six AT44 6x6's were used to support the event, four went all the way to Pole (more information about all 4 ventures). The Moon Regan Expedition shows up with more rubber-tired vans and a strange vehicle (3 December). The main vehicles for this trip were two modified 6x6 Ford vans from Icecool...what you see in this photo is the Bio-Inspired Vehicle...an ice sled powered by biofuel. 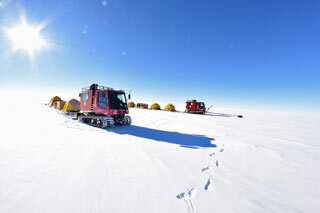 This trip planned a trans-Antarctic crossing from Union Glacier to McMurdo, but because of delays they turned around at the Ross Ice Shelf at the bottom of the Leverett Glacier. 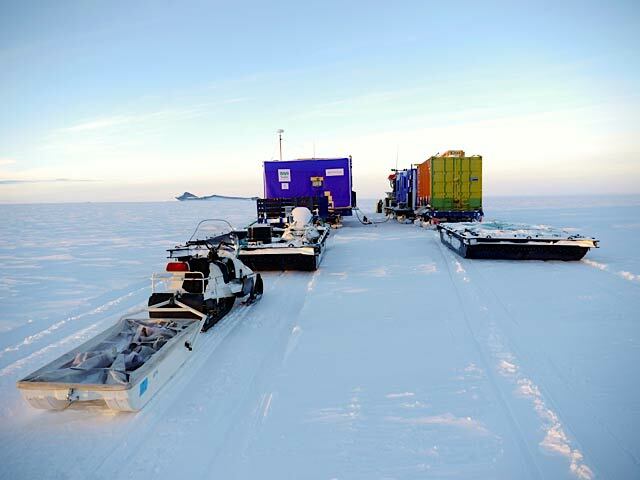 This BIV was only driven as far as Pole; it was parked while the team continued to the Ross Ice Shelf and was towed back to Union Glacier on the return trip (more info, photos, credits and links). So...what happened this summer was that a new alternator showed up in a 10,000 lb crate...something to seriously test out those roller conveyors in the LO. This alternator was installed on generator #1; the old one was shipped out to be rebuilt and installed on #3 in 2011-12, etc. Yes, the "new" power plant is now 11 years old--so this was due. In the original dome power plant the alternators were replaced after 10 years of service... partly because of rear main seal issues and partly to get slightly larger units. 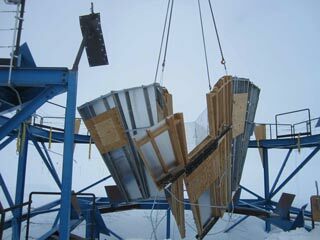 Here it is being moved into the power plant arch (photos from Michelle Springer). 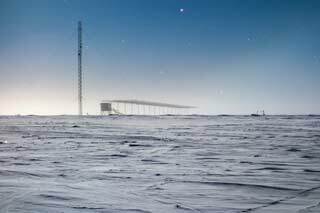 ...and test installations begin for the Askaryan Radio Array (ARA). Old Pole blasted into (presumably) smithereens. South Pole Telescope jacked up to replace azimuth bearing/gear. The bearing was disintegrating...there was metal in the lubricant, so it had to be replaced. 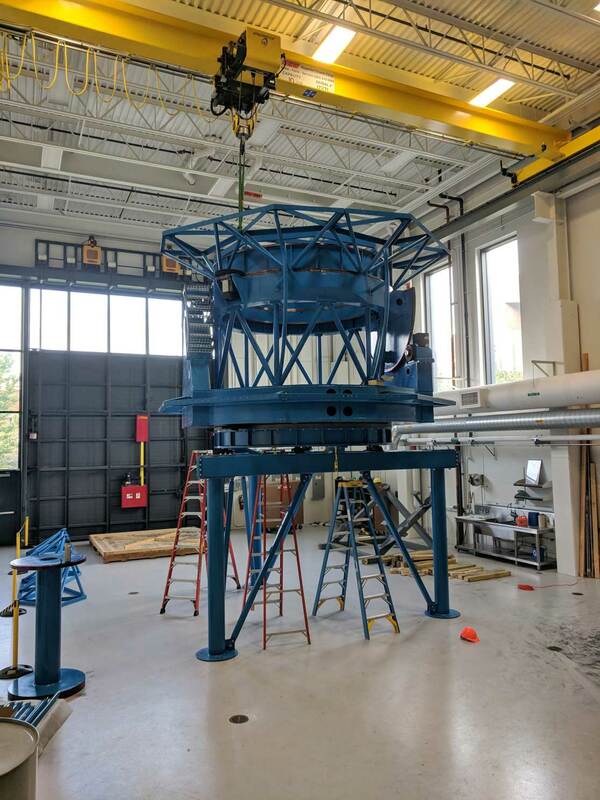 The consortium brought in Mammoet, a heavy lift contractor, to install structural steel and jacks to jack up the telescope, and this sliding skid so that the old gear could be removed and the new one installed. Lots of heavy precision work...the full story and photos. This building was the first structure to be constructed in the Dark Sector (well, since Old Pole), and there had been consideration given to jacking it up if the appropriate science project came along...but that didn't happen. Here's the rest of the story. 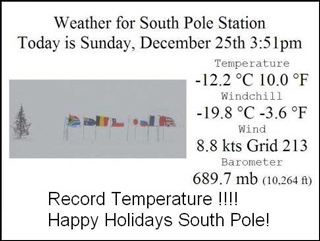 First documented USAP "real" South Pole Marathon (16 January). 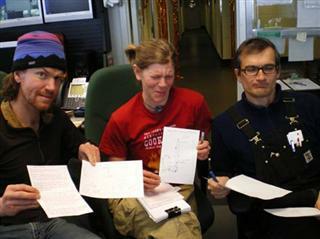 No, the marathon itself was not this paper exercise, but the race had to be planned out on short notice after the flights for these 3 erstwhile competitors in the McM Ice Marathon were cancelled. Rickey Gates (left), Christina Knoblock, and Marco Tortonese sit in comms the day before the race, plotting the course, planning the aid stations, and soliciting supporters and volunteers. The event actually featured eleven participants and 4 full marathon finishers (all the details). Extreme World Races brings reality TV to Pole with an Austria/Germany team race. This race, a prelude to the larger event planned for the centenary 2011-12 season, featured two four-person teams from Austria and Germany in a two-stage 250-mile race to Pole...featured on Austrian and German television. Who won? Well, it was kept a secret until March 2011, but the results, details, links to videos, and Pole party pictures are here. 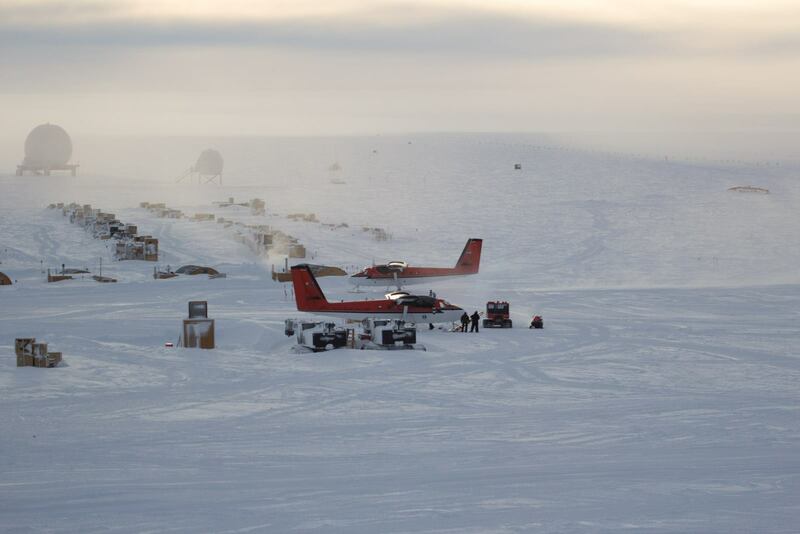 Chinese expeditioner medevaced from Dome A to Davis Station (7 January)--originally when the member suffered altitude sickness, the Chinese program contacted Pole...and flight planning began, eventually resulting in a Twin Otter flight from Davis which returned the patient to sea level. He commenced recovery, was transferred to the Chinese expedition vessel and later returned to China (2011 report presented at the XXXIV Antarctic treaty meeting in Buenos Aires, June 2011) (MS Word document). 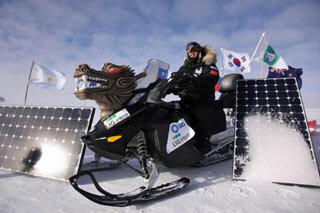 Korean "green expedition" arrives from the coast on solar-powered electric snowmobiles. 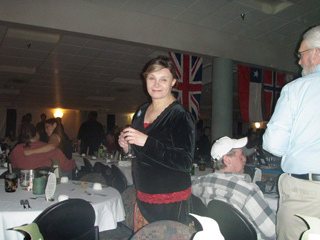 Manager: Renée-Nicole Douceur, population 49 (list and photos). 6.3 Christchurch earthquake (22 February) wipes out much of the city we know and love, kills 200+, and disrupts the final summer redeployment. 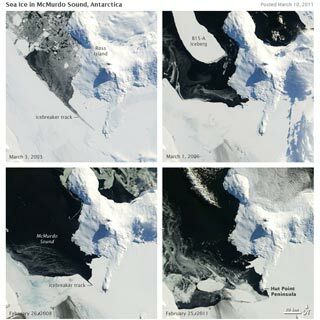 A major storm helped produce the most significant McMurdo ice breakout since 1998. 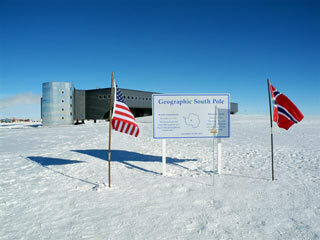 Strange February expedition to Pole ends up with 3 lost. Top ring of the dome is reconstructed in Port Hueneme museum. 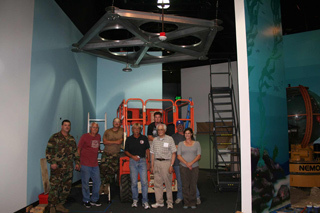 Eighteen months after the dome was deconstructed, in July 2011 the top ring was reassembled in the new Seabee Museum just out- side the gates of the Port Hueneme Seabee base (which, of course, also supports all of the surface cargo shipments to Antarctica to this day). Read the story and see the rest of the pictures and links...here. 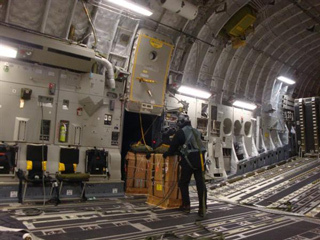 Late winter airdrop delivers urgently needed medical supplies (39 August). 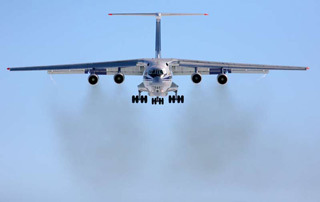 The successful airdrop mission was added to the third scheduled Air Force winfly flight. Two packages, about 200 pounds each, were dropped and retrieved without incident...in addition to the medical stuff, there were other items including Cat parts, a few oranges, and a fair amount of mail, including some mail order items that had been ordered only 10 days before the airdrop (!) Here are (more details, photos, and links to news coverage and video. Winter site manager Renée-Nicole Douceur has an apparent stroke (8/27). All time wind speed record broken (27 September). 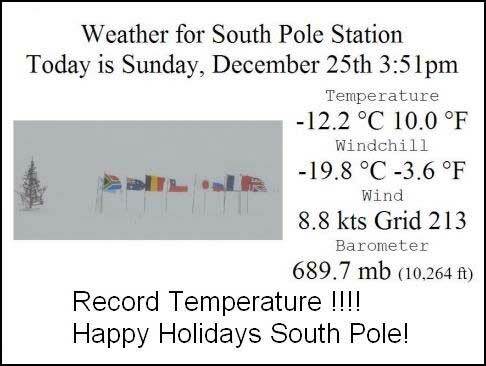 According to Tim Markle in met, "...the peak wind speed of 50kts/ 58mph broke the record for the all-time strongest wind speed at South Pole. The previous record of 48kts/55mph was set on August 24th, 1989." At left is Robert Schwarz's photo of what MAPO looked like after the storm. The storm raged from the 21st to the 27th. 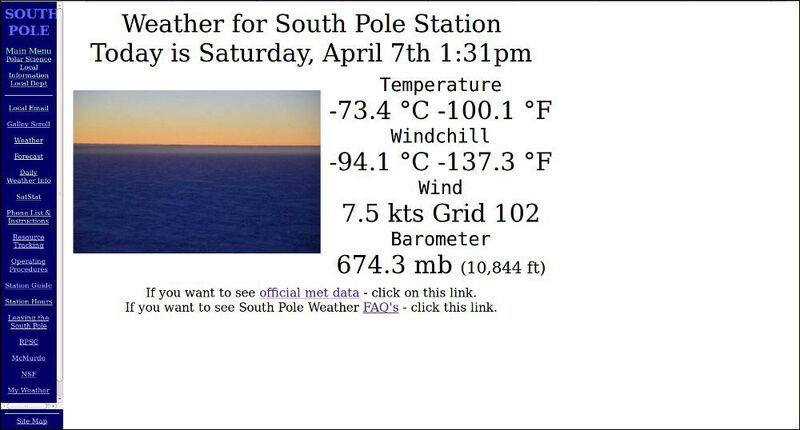 This Antarctic Sun article outlines the details and all of the new records that were set. ...and the first centenary event itself: the 100th anniversary of Amundsen's arrival on 14 December. 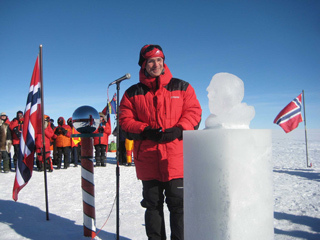 The highlight of the event was a ceremony at 1600 on the 14th, in which the Prime Minister of Norway, Jens Stoltenberg spoke and unveiled an ice bust of Roald Amundsen. There were other speeches and special music at the ceremony...and the event also featured ski touring, a reception and dinner...and the arrival of a Norwegian ski team clad in replica clothing from Amundsen's day. And there were other tourists camped out nearby...in fact, there were an estimated 93 tourists at Pole, along with 233 USAP members around--an all time population record. And most of them were at the ceremony (my coverage). Two of these structures were renovated inside and out...the PV panels on the roof put more power into the grid than is used inside. Other energy saving ideas were implemented or tested, some worked very well, some... didn't. But the effort will continue since the generators aren't getting any newer or more powerful (more info and photos). Interestingly, at the end of the summer, two Jamesways at the north corner of summer camp were removed and replaced by the other two Hypertats, which had been sitting at the End of the World for several years. Of course, this was before the drastic 2012-13 population reduction had been announced, making their use unnecessary. CRREL/Dartmouth robot "Yeti" surveys Old Pole with ground penetrating radar. The robotic device seen here in front of the station is one of several developed by the folks in New Hampshire over the past few years for use in Greenland and Antarctica, was autonomously controlled as it took GPR data... and determined that there was still a bit more remediation work to be done (more info). 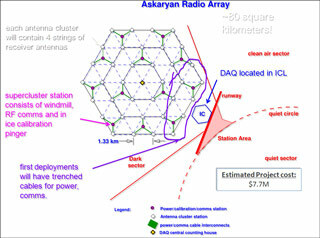 ...such as the deployment of the first of 37 planned "clusters" for the Askaryan Radio Array. 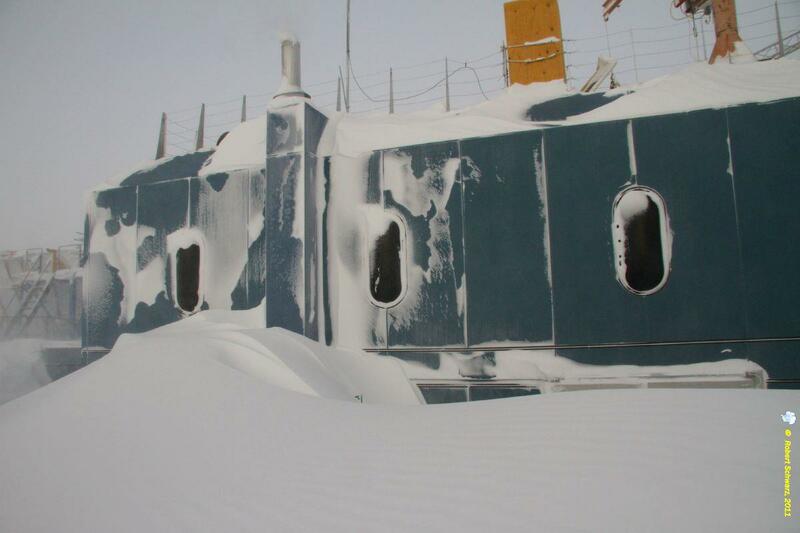 The McMurdo sealift can never be taken for granted... sometimes there have been huge icebergs in the area... sometimes the ice near the bay has been too thick, requiring long hoses to get the fuel to town... and sometimes, well, this year there were many problems. First, there were difficulties in acquiring an icebreaker. 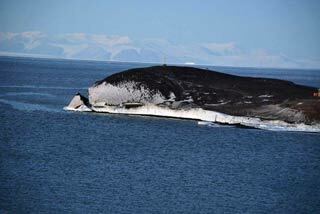 Then, a ban on heavy fuel use in the Southern Ocean required a search for a suitable tanker. And there was a new contract for the cargo vessel as well. Finally construction of the ice pier didn't go well because of warm weather...so an Army unit had to be called upon to provide a modular causeway system to be used instead. And all went well! Here's the full story with many pages of photos, video links, and the rest of the details. Here's the new sign in front of the building in Centennial...an impressive logo! this is a fresh photo taken by Elaine Hood on a July afternoon with solar illumination. My coverage of the long process that led to the contract change is here. This year was the earliest ever that the temperature dipped into 3 digits (ºF). The previous earliest running of the 300 Club was also on 7 April in 1982, but this year the temperature dropped below -100ºF about an hour earlier than in 1982. This year the temperature hit 3 digits at least 7 times (depending on how you count); the coldest was -104.8ºF/-76.0ºC on 15 July, and the latest was on 7 September. There were no official 300 Club events for 2007 through 2009; in 2007 the temp dipped into 3 digits too briefly for anything to happen. Still, it has been awhile since it got as cold as it did during my 2005 winter. Her body was found behind their Whidbey Island home in early June. Husband Al Baker was arrested and charged with first degree murder, with the trial now scheduled for early 2013. The photographer who took this photo of Kathie has an amazing tribute to her. I attended a celebration of her life in Evergreen, CO in August. Here are my details. My first thought when posting this was...what is wrong here...I've had to chronicle two tragic deaths in a row? But that is life. Nick (known to some as Darin) poked at some of the seemingly incongruous administrative and cultural issues for years on his bigdeadplace blog, and he later compiled some of the details in the book of that name, which I highly recommend. 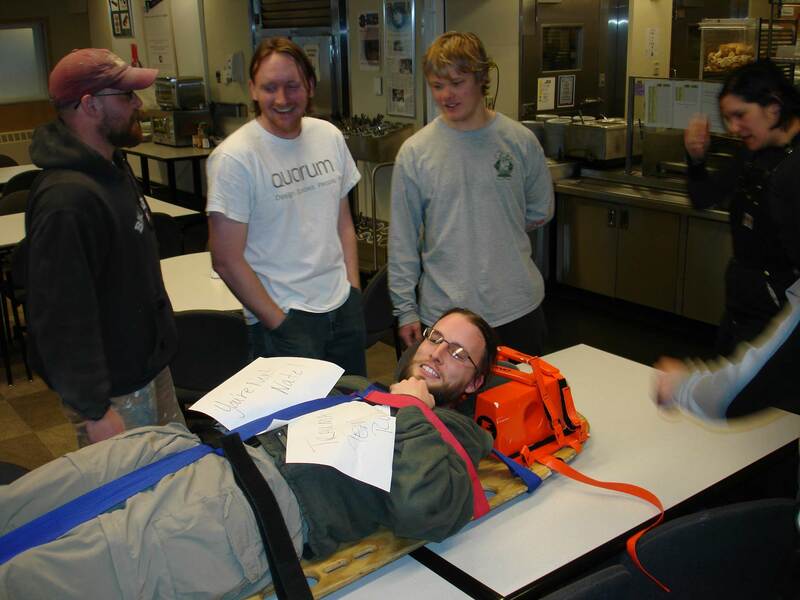 Nick wintered at McMurdo in 2001 and 2008 and at Pole in 2004, and spent other seasons on the ice as well. His writing showed great intelligence, incisiveness, humor, and a sense of history...we of course communicated off and on for a number of years. Our most recent email communication was a few years ago when he was working in Afghanistan...the topics were body armor (he wasn't wearing any) and the Jake Speed incident in Greenland. The photo above left is from Kathy Blumm, taken at McMurdo during the 1999-2000 summer when they both worked in waste management. 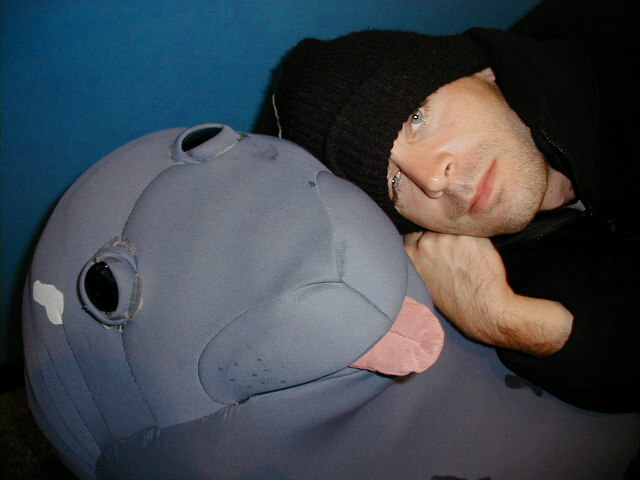 Here's a good tribute from his fellow Antarctican author Jason Anthony who was at McM with him during that same season. How I learned of how he ended his life (from his publisher) is not pretty. Rodwell 3 put in service (New Years weekend). New projects like SuperDARN alter the local landscape. This project had been planned for Pole for a number of years, but finally it happened. First light was on 21 January. Briefly, it is "...a global international radar network of 22 installations observing high frequency (HF) bands between 8 and 22 MHz. Radar systems have been installed at McMurdo (2009-10) and South Pole (2011-12), extending the global-scale coverage in the Southern hemisphere and helping answer questions about geomagnetic conjugacy of global magnetic storms and substorms and differences in the ionospheric plasma convection caused by the asymmetry of solar illumination in both hemispheres." (a quote from the science planning summary). It consists of a series of antennas located on the east side of the station arches...and a control building created from the old SPASE-2 structure (more coverage). After the 2011-12 investigations by the YETI robot rover, it was decided to excavate the south end of the builder's tunnel where voids were found, as seen here. Still to come...making them go away (the documentation). 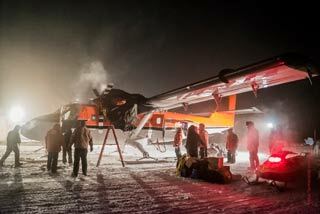 Tragic Twin Otter crash kills all three Canadian crew members (23 January). 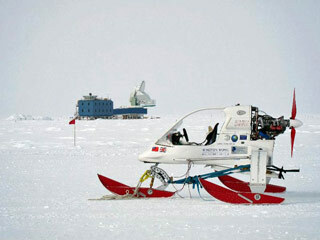 The Kenn Borek aircraft (left, a 2011 photo of it) had been at Pole for two days, when it was directed to head to the Italian station at Terra Nova Bay. At 2200 it missed its hourly comms checkin, and a few minutes later its emergency locater transmitter was detected. After several days of bad weather and eventual searches, the aircraft was discovered...accordioned into the side of 13,000-foot Mt. Elizabeth, halfway between McM and Pole. The crash was not survivable (details). Manager: Weeks Heist, population 44 (list and photos). NSF publishes response to the 2012 Blue Ribbon Panel report (21 March). The response, as with the 2012 report, didn't deal much with Pole, as the current station came about because of the previous 1997 report. 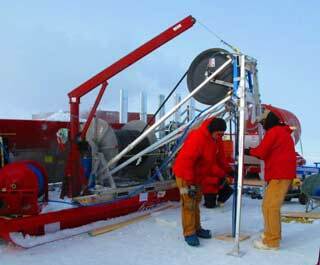 Some items were included in NSF's 2014 budget (Antarctic Sun article). The only Pole items addressed were traverse vehicles and automation (included in the budget) and that hard-surface runway. 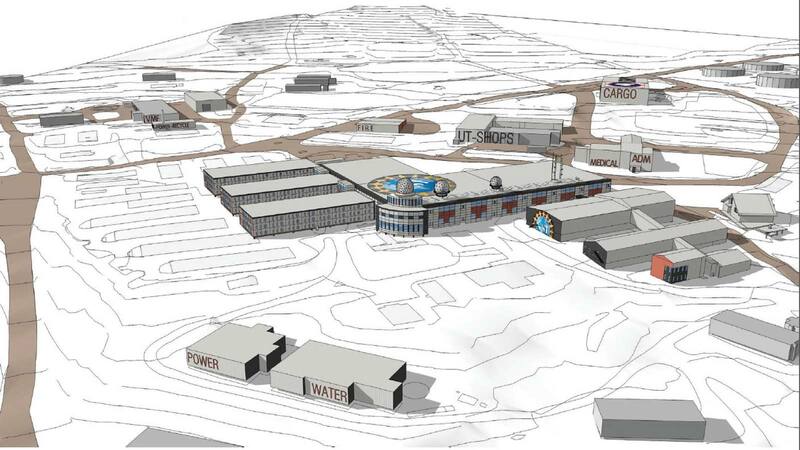 The big items involved McMurdo...such as the master plan (left)--here's the NSF press release, and here's the "coffee table" version of the plan...and Palmer. The first Palmer recommendations--a new boat dock and ramp--have been implemented, and the pier is being studied (info). NASA selects the 2013 class of eight astronauts...including four women, two of whom have Antarctic experience (17 June). Here's one of them, Christina Hammock, who wintered with me at Pole in 2005 as the cryo science tech. 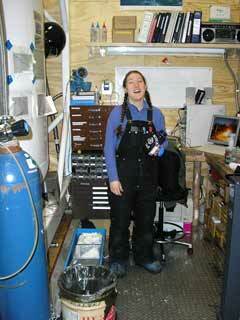 I took this photo of her in what then was the cryo office in September 2005. She gave a couple of us the $10 tour of cryo that day...which included an opportunity to help transfer some liquid helium to one of the small dewars for the telescopes in the dark sector (more pictures of cryo...and Christina!) 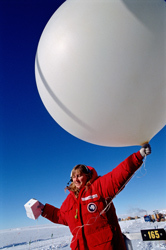 The other ice person selected by NASA was Jessica Meir, who did penguin studies near McMurdo between 2004 and 2008. Other news coverage...the official NASA announcement, this Samoa News article (most recently she was working for NOAA at their station on American Samoa), and this Antarctic Sun article. 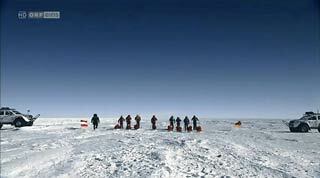 Sir Ranulph (Ran) Fiennes' private British expedition "The Coldest Journey" cancels their winter crossing from Crown Bay (near Princess Elisabeth Station) to Ross Island (18 June). Ran aggravated old frostbite injuries to his left hand during the preliminary stage and had to bow out, leaving five men to complete the trip with two D6N tractors pulling "cabooses" and fuel sleds. They set out on 21 March with plans to reach Pole in time for Midwinters Day...but on 18 June, still mired in an extensive crevasse field which they couldn't escape before dark, they called off further progress after traveling only 195 miles. They continued their science program and would return to Crown Bay in the spring. Here's more of my commentary, the expedition website, and my coverage of Ran's successful arrival at Pole--the Transglobe Expedition--in December 1981. 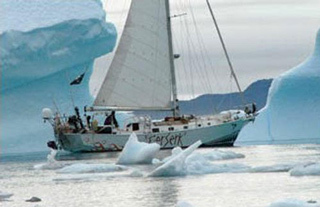 The photo at left was taken by Ian Prickett on 22 March, the day after the departure from Crown Bay. What is now known as the GOES antenna elevation drive successfully repaired (September). This is the third time this has needed winter attention-- by now there is a level of experience, and it is a bit warmer and easier to work on. 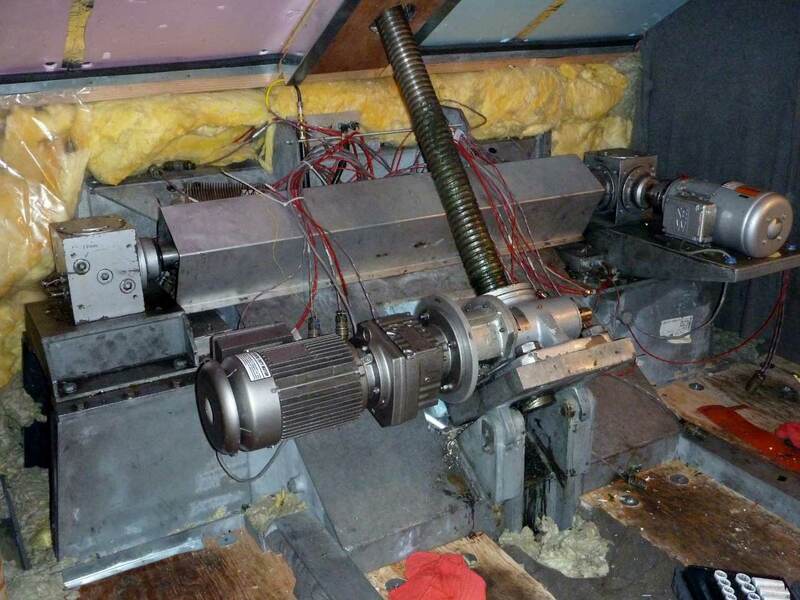 The first problem occurred in 2004 winter when the elevation worm gear (seen here) was stripped out (the azimuth worm gear is behind it under the metal cover). There was no radome at the time, and no spare parts, so the elevation was locked in place for the winter, which reduced the satellite pass times. During the 2008 winter the assembly required replacement again, the old unit was later rebuilt. 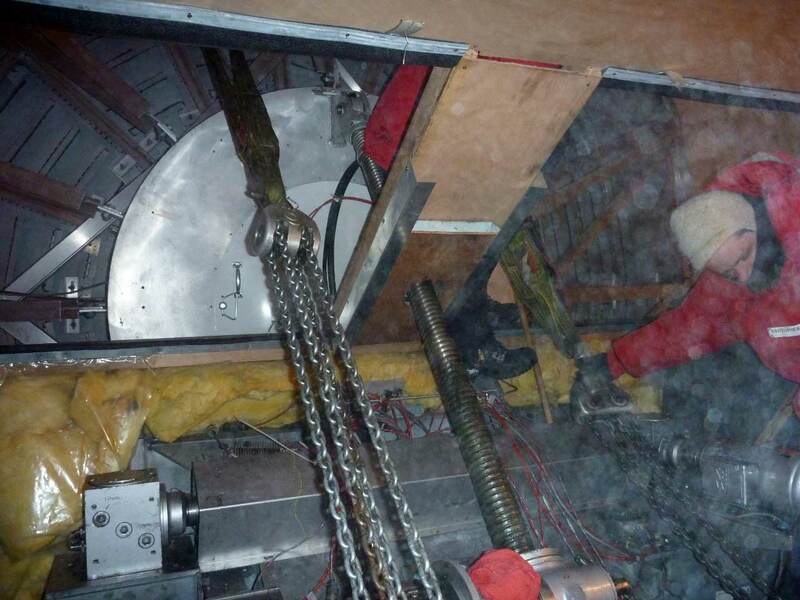 The drives are inside a heated enclosure, but it got cold after some insulation has to be removed to secure the antenna with come-alongs and straps. 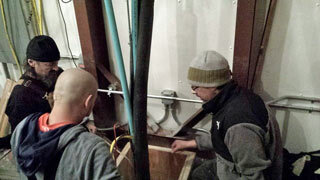 Two crews alternated working and warming up inside the heated RF shelter (photos from satcom tech Mike Rice). Sewer outfall (the original 1994 rodwell) fills up and starts to flood the tunnels; station switched to using the emergency outfall. Earliest opening flight in history (8 October). USAP program put into "caretaker status" due to U.S. government shutdown and lack of funding (9 October). The politics are too divisive and complex to be discussed here, but the facts are that the USAP didn't have the funding to continue the program except to maintain and protect the facilities while canceling the science...which they were forced to do...until 16 October when Congress provided continuing government funding. The effects on Pole science may turn out to be minimal, although some of the summer construction program was cut back. Similarly at Palmer, where the LMG was less than 24 hours away from taking the science groups back north when the funding was restored. 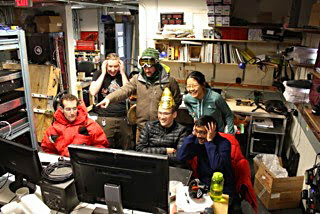 At and around McMurdo, things were a bit more drastic, and a number of science projects were cancelled or cut back. The details are here (the December 2011 photo at left is by Sven Lidstrom from the USAP photo library. Although the new rodwell (RW3) was put online in 2012-13, the conversion of the old rodwell (RW2) to a sewer couldn't be completed because of problems accessing the hole. So plans were made to mobilize a crew from PSL, which was possible because the ARA project wasn't funded for this season. These folks, plus station forces, SCOARA summer machinist Dave Pernic, and members of the SPoT team, drilled new access to RW2 so it could be converted into a sewer outfall. They also created a new emergency sewer outfall, and happened to be on hand when a power outage knocked out the rodwell water pump; it couldn't be pulled out, so they were called upon to ream out the well pump access hole (the rest of the story). Yet another explosive blast conducted at Old Pole (4 December). Previous surveys indicated some areas that still needed attention. And as the SPoT team carries explosives and is trained to use them, their help was enlisted to set off a bit of explosive (well, 1200 pounds worth). With the usual audience of spectators, on the roof of DSL (documentation). Part of summer camp dismantled. The place hasn't been used for a couple of years because the summer station population is small enough to house in the elevated station. So one corner of it (several Jamesways) were taken down (documentation). "Expeditions 7" NGO venture visits Pole and jazzes up the place. 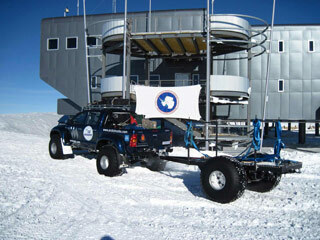 They decided they wanted to drive their Toyota Land Cruiser on all continents, so they hired Arctic Trucks to help them do Antarctica--a 3400-mile return trip from Novo, via Pole, to the point on the Leverett Glacier that marked the land/ice boundary--about 300 miles north along the traverse route. 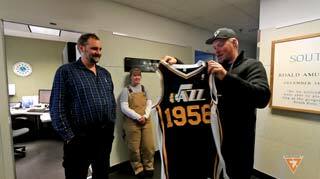 The group included Utah Jazz owner Greg Miller who is seen here presenting area manager Bill Coughran with a unique Jazz jersey, as WSM Shelly Finley looks on (more info and video link). An end-of-season postscript on the government shutdown--this 13 February ScienceInsider article outlines the actual effects on several projects...as well as the impact of the early February "perfect storm" which destroyed the ice pier and sent the Maersk Illinois away early before the ice core freezer milvans could be loaded. 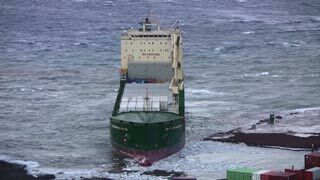 The article includes a link to Jessica Lane's blog posts about the cargo vessel operations and the storm. Another end-of-season issue--warm McM weather and dark dust again caused the Pegasus ice runway to melt. This season it was even worse, and eventually all end-of-season wheeled aircraft flights were cancelled (24 January Antarctic Sun article and 14 February 2014 109th Airlift Wing article. And then there was that storm that blew in on 6 February which ended the cargo retrograde early, among other things. The storm brought winds from an unusual angle, and there was no ice in the area to inhibit the wave action. In this photo, the cargo vessel Maersk Illinois was unsuccessfully attempting to leverage a departure against a deteriorating ice pier. 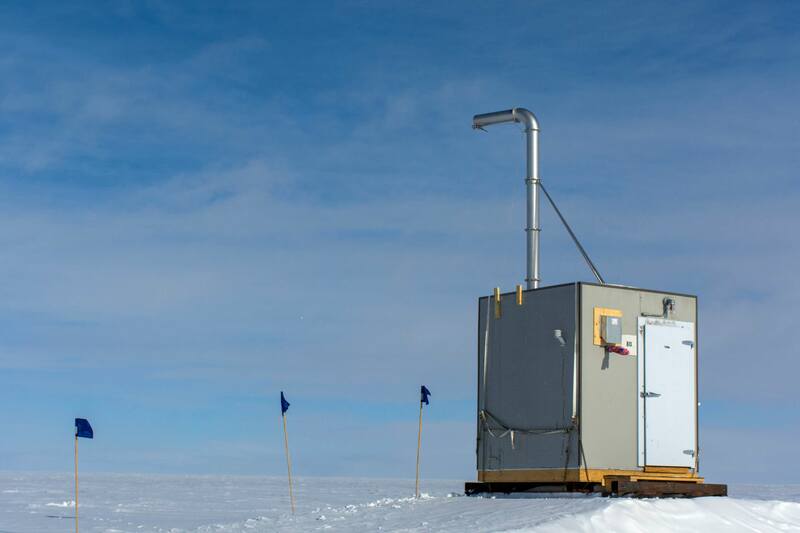 This storm put an early end to the retrograde, causing many milvans of ice cores, science and other cargo, and waste to be left behind (more information and video). 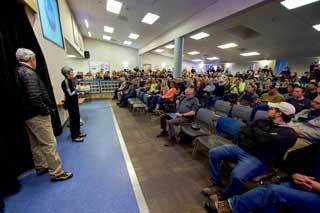 As a result, the annual Port Hueneme auction of salvageable retrograde was cancelled. Nevertheless, two of the three IGY era Caterpillar stretch D8's were shipped north. Manager: Shelly Finley, population 41 (list and photos). 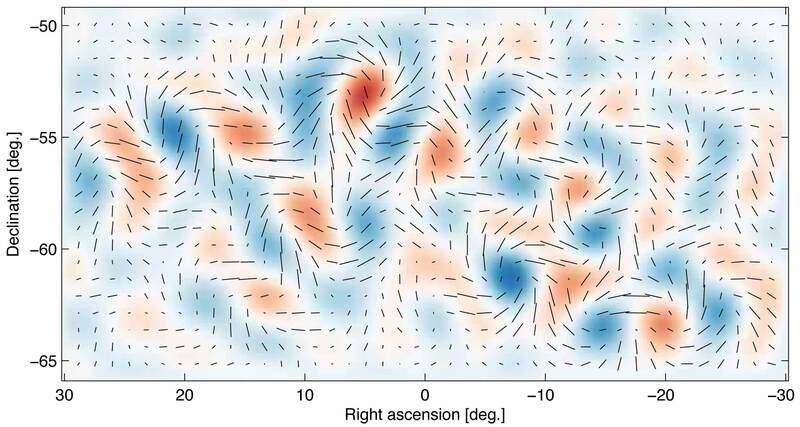 BICEP2 collaboration announces "first direct evidence of cosmic inflation" (17 March). 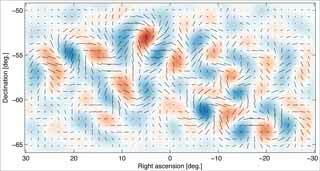 The BICEP collaboration announced that they'd detected the first direct evidence of cosmic inflation the press conference report) and the news conference video) (at left, the actual B-mode pattern observed with the BICEP2 telescope). This created major shock waves in the cosmology community...and after other researchers dug up other information, it turned out that the announcement was a bit premature. So...the BICEP folks went back to work, and as of the 2018 winter Hans Boenish is back for his third winter, the second as the BICEP3 operator. More 2014 info...the NSF press release, this Antarctic Sun article, and a Science News interview with friend Steffen Richter, who was the 2012 BICEP2 winterover. 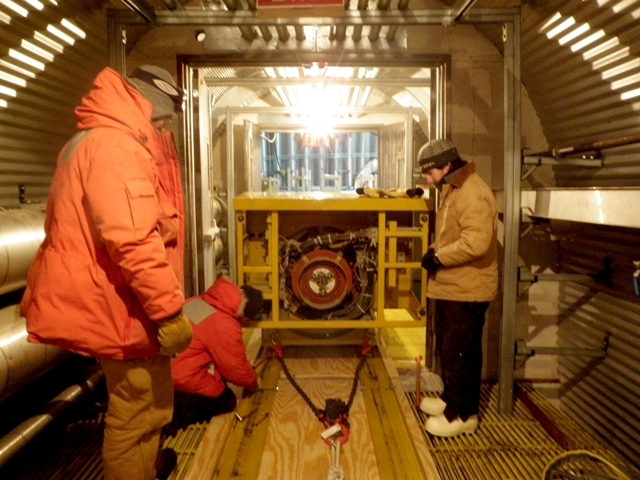 VIPER telescope returns to life...in New York State. The telescope, which had been removed from Pole during the 2006-07 season, was reassembled amidst the science buildings at Siena College (in Loudonville, NY, just north of Albany), and tentatively renamed the Siena Radio Telescope (SRT). 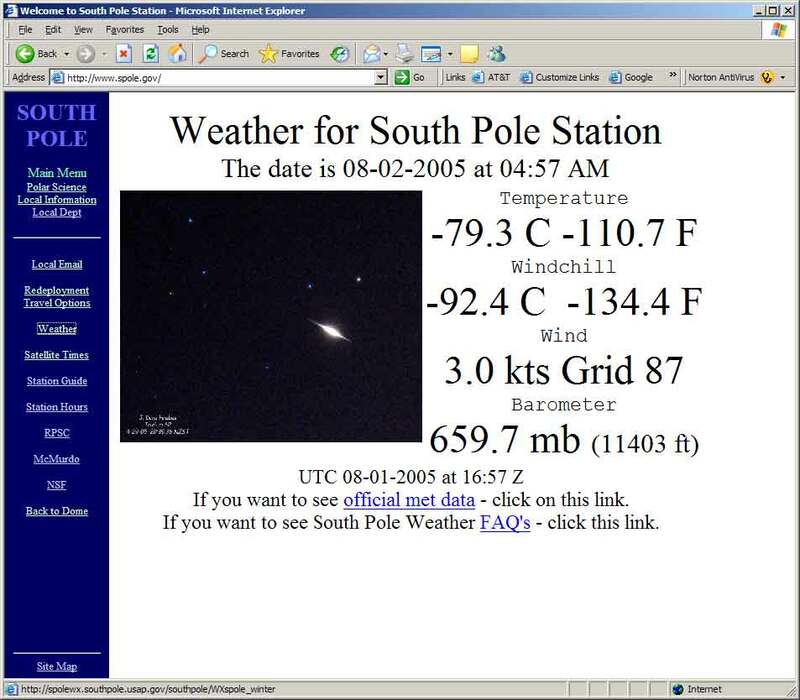 The instrument was shut down at Pole at the end of the 2005 winter...during which many us had a $10 tour of the project by its last operator there, Jessica Dempsey. 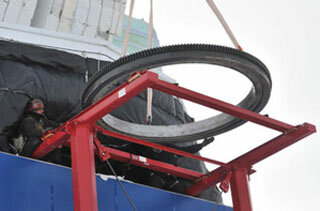 Here are more photos of the telescope and its removal. This July 2014 Siena College news article has more information and photos about the installation at Siena, including the one at left. 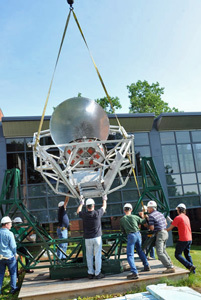 This July 2012 article describes the telescope shipment arrival at campus. As of July 2018 the telescope had been dormant for awhile, but I learned that there is a new effort to bring it back to life. Rodwell failure puts the station on the emergency snow melter (27 September). The rodwell pump quit working. And although there was a spare pump, nothing could be done because the non-working pump can't be pulled up the well shaft...it was stuck partway. So...the emergency snow melter was dug out from its usual spot next to B1 and towed to the downwind end of the LOarch so it could be hooked into the main station water system. There were some difficulties with frozen glycol and water in the piping, but it worked well enough that no one died of thirst. Needless to say, urgent plans were made to fix things at the beginning of the summer, perhaps after the arrival of the first Basler. At left, Clair Von Handorf operates the loader while Ryan Boggs and Rich Young watch (photo from Shelly Finley). ...after the arrival of the first Basler on the 28th bringing an ice drill and a few folks to help. This was before the first Herc showed up. The pump had been stuck about 160 feet down. 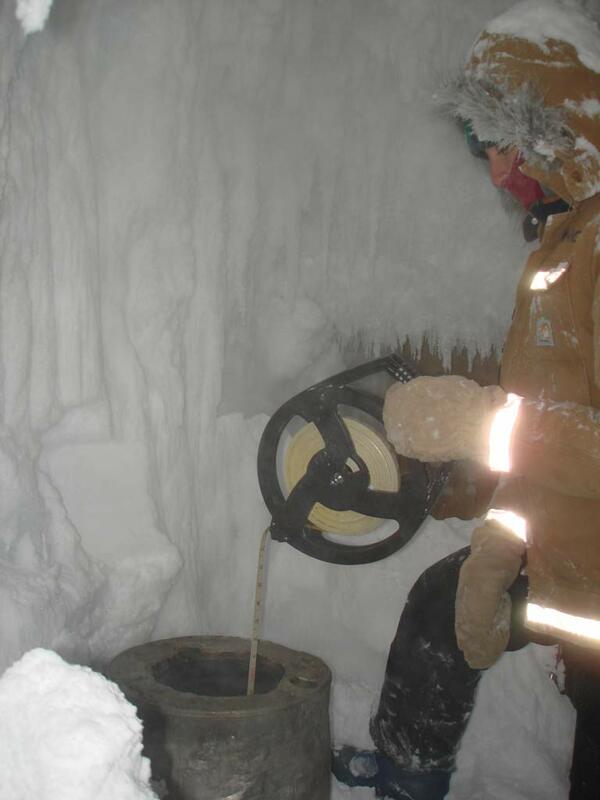 A few days later the well shaft had been cleaned out and the rodwell was back on line...no more snow melting required (details). Controls tech Thomas Lawrence Atkins found dead in his room (1 December). Thomas failed to report for work that day, and was then discovered to be deceased. Thomas, age 40, was a master electrician from Greenville, Muhlenberg County, KY, employed by PAE. This was his first season on the ice. This is the official NSF press release announcing his death. The word from Pole is that Thomas was a "phantom of the camera"--thus there are no good photos of him on station. The photo at left is the only one we've been able to find so far--it appears in his obituary. He is the fourth person to die at Pole...he will now join the other three departed Polies who have seats at the table for the special dinners. Cryo building moved ~50 feet west (27 December). So what is this? It seems that underneath Cryo and the adjacent BIF was...Rodwell 1 aka the old sewer bulb...which had filled up and caused things to settle. A long story (which I'll get to, along with more photos). It took all of this tractor power to move the building, and a bit of bulldozing to push the 3 modules back together afterward. More details and the rest of the photos are here. 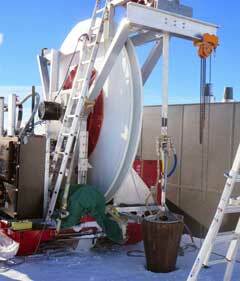 Two-year SPICE Core drilling project begins work. 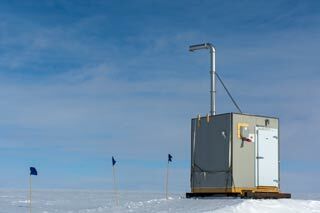 The multidisciplinary project was set up at a new site about 1/2 mile west of the IceCube laboratory. The goal is to collect cores down to a depth of 1500m. During the 2014-15 season they made it almost halfway...down to 736m. Drillers at Vostok reach the lake through a new borehole. 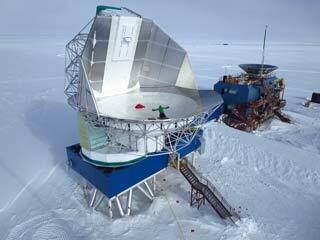 BICEP3 telescope achieves first light (13 January). The event happened on the same evening that the cosmologists at the other end of DSL (the South Pole Telescope) turned on their "Event Horizon Telescope" view. This image was posted by Roger O'Brient on his 'fortress of solitude' blog...where he also posted this rather amazing timelapse video of the loading of BICEP3 into its mount. VIPER telescope structure removed from the west end of MAPO. The VIPER telescope was decommissioned at the end of my 2005 winter (in November), the instrument was removed in 2006-07 and and shipped to Siena College. 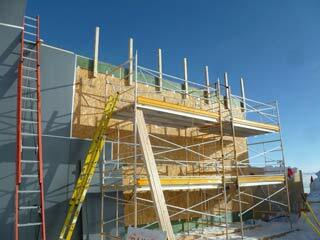 The remaining structure was an impediment to the necessary moving/raising of MAPO. 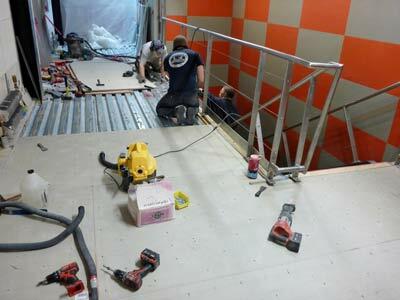 Here's a photo of the removal of the ground shield, one of the early steps in demoing the structure. More photos and information...here. 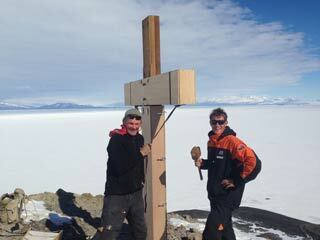 Protective encasement installed on the Observation Hill cross. 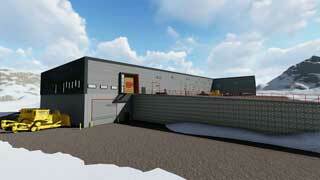 Summer camp Jamesway J-10 converted into cold storage warehouse. Ice tunnel warmup shack replaced. The original warmup shack hadn't been heated or used at least since my 2005 winter, but now with the new rodwell at the far end of the main tunnel, it was decided to demo the original shack, hack out ice blocks, and create a new shack (all of the photos). First scheduled winter flights to McMurdo since 1967--the Australian A-319 on 18 April, and two USAF C-17 flights on 3 June and 18 July. The July flight had to boomerang briefly after takeoff from Christchurch after a bird strike just above the pilot's window (August Antarctic Sun article). The Department of Defense changes criteria for the Antarctic Service Medal (15 May)...one change is to reduce the time-on-ice requirement from 30 to 10 days, but also the "wintered over clasp" criteria was changed to define "winterover" to be from March through October. The documentation--an annotated excerpt of the original instruction revision and a link to the current (November 2016) document (the Antarctic Service Medal section begins on page 22). 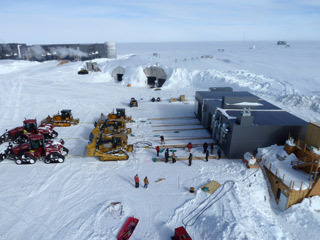 CRYO (which was relocated in 2014-15) being converted into the new Balloon Inflation Facility (BIF). It seems that the old balloon inflation facility is sitting on top of the original rodwell...later to become the sewer bulb...that was used for too long and grew up into the firn. So the BIF started to sink. Hence the new construction. Not the first time that sewer bulbs have overflowed...the original one at the end of the dome utilidor started to flood in 1980, causing a...mess that more than one friend of mine had to chip out. The replacement BIF was closed in by the end of summer and is now in use, although further work remains to complete the facility. Some photos here...more coming soon. 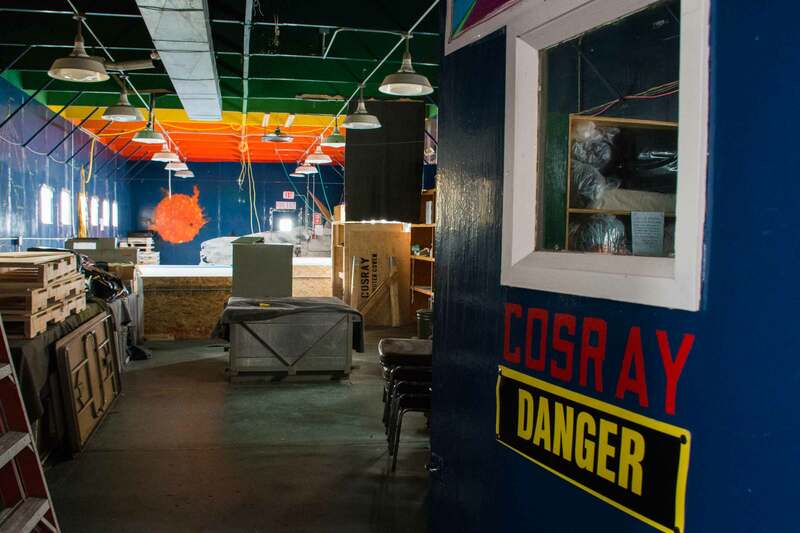 McMurdo cosray lab relocation underway. The first cosmic ray data from McMurdo was sent to Marty Pomerantz at the Bartol Research Institute on 11 May 1960...not from this building, but from the original one on the McMurdo side of Observation Hill. But that site turned out to be too close to the nuclear plant, so this structure was built by NMCB-1 in 1961-62. For some years there has been talk of getting rid of the project, or at least the building...now that is happening, as the project is being moved in stages to the new South Korean Jang Bogo, roughly 230 miles north. The first phase of the move is complete and operating; the remaining segments will be relocated in 2016-17. The December 2010 photo at left is by Peter Rejcek; this November 2015 interior shot is by Michael Lucibella (both from the Antarctic Photo Library). 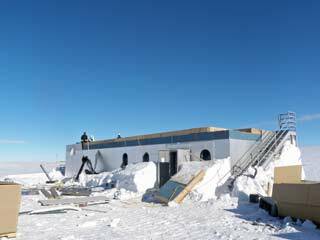 This February 2016 Antarctic Sun article describes the move. 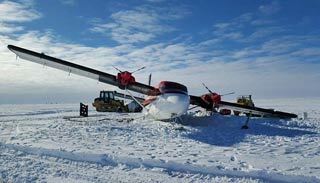 Twin Otter loses a ski while taking off (20 January). 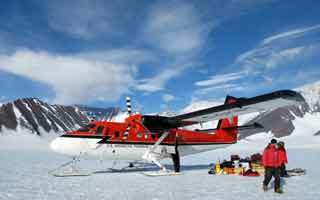 The Kenn Borek aircraft had completed its ice charter and was en route to Rothera on its way back to Calgary; there were only the two pilots aboard...along with a heavy fuel load. It was not considered a "crash," rather an incident involving a patch of soft snow that caused the aircraft to leave the skiway. No injuries, but there was a bit of damage to the undercarriage and a wing. More information and photos here." 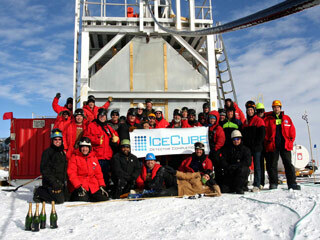 The South Pole Ice Core (SPICECORE) completes drilling, reaching 1751 meters (1800 23 January). 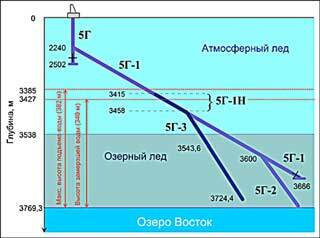 The original two-year drilling goal of 1500m was exceeded by 17%! 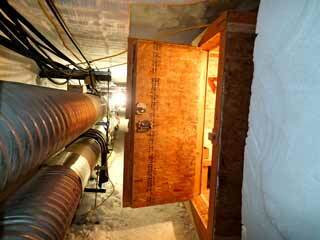 This is the drill shelter as it was left for the winter. The drill trench in the center of this shelter was filled in, as drilling was done and the drill was packed up, but the winch and cable were left for borehole logging next season. And there will be four Air Force pallets of cores to be shipped out next season. 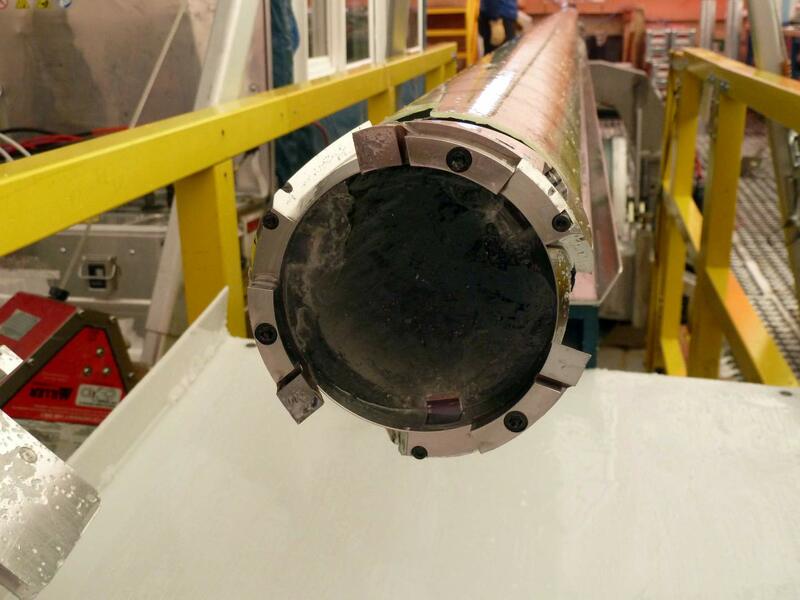 The photo at left is credited to Jay Johnson; here is another photo (also by Jay) showing the final core from 1751m before it is retrieved from the barrel of the intermediate depth drill. 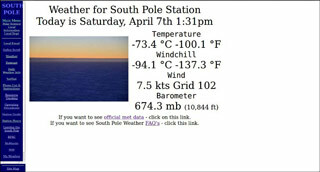 More info and these and other photos from the SpiceCore web site, as well as this excellent 12 April 2016 Antarctic Sun article. Manager: Craig Knott; population 48 (list and photos). 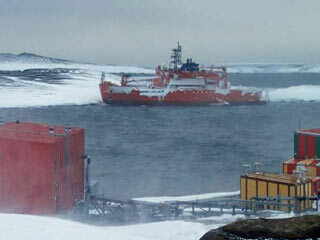 Australian icebreaker Aurora Australis runs aground off Mawson (24 February). 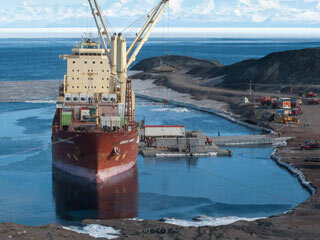 The ship broke free of its moorings in Horseshoe Harbour (left, AAD photo) where it had been since 20 February. Internal inspections revealed no hull breach, but later, a breach in a normally full ballast tank was discovered, but with no danger of fuel leakage. It was refloated on the 26th, and eventually sailed north on 2 March, arriving Fremantle on the 23rd. Meanwhile, 35 researchers at Davis who'd been scheduled to head home on the vessel were flown to McM on 27 February by the NYANG (NYANG news article). 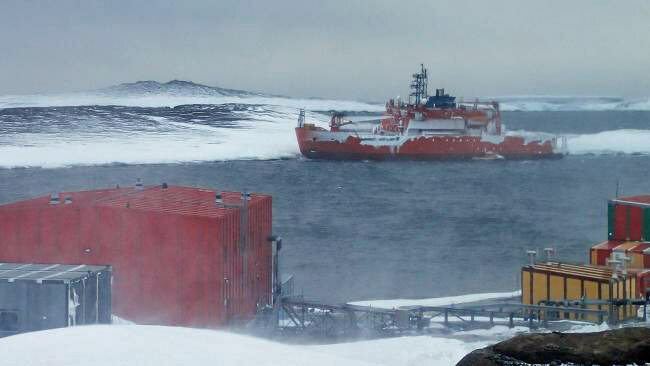 Later, on 7 March, other researchers at Mawson were given a lift to Casey by the Japanese icebreaker Shirase, from there they were flown north on the Australian Airbus. For the moment, the chronology of this story is best followed on the AAD news page. NSF officially announces the name of the under-construction "Alpha Runway"--Phoenix! (7 April). NSF has been studying a revised or new airfield plan for several years, in part because warm weather and dust clouds have made the facility and access roads unusable at times in late summer. In early April, the new airfield, under development during 2015-16, was officially named "Phoenix Airfield." 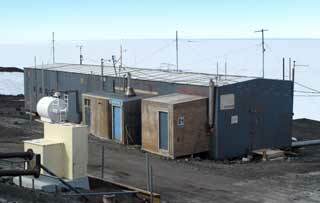 The facility is several miles closer to McMurdo, and it is expected to be certified and in use in 2016-17 (the full story). 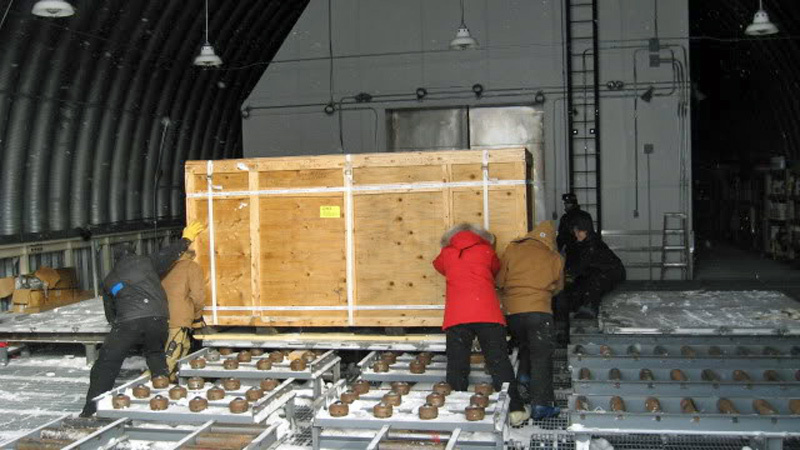 ...after the two Kenn Borek Air Twin Otters departed Calgary, proceeded south with a brief stop in Centennial, CO...and eventually arrived at Pole at about 0930 22 June (at left, the aircraft is being unloaded, insulated, and closed up after arrival at Pole. 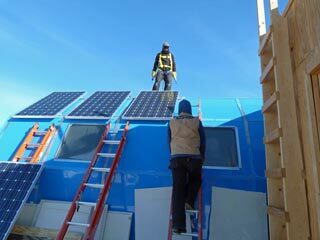 Eventually, two patients were safely evacuated to Punta Arenas. The full story is here, along with many news, photo and video links. GOES-3 satellite decommissioned (29 June); now officially replaced by DSCS-3. 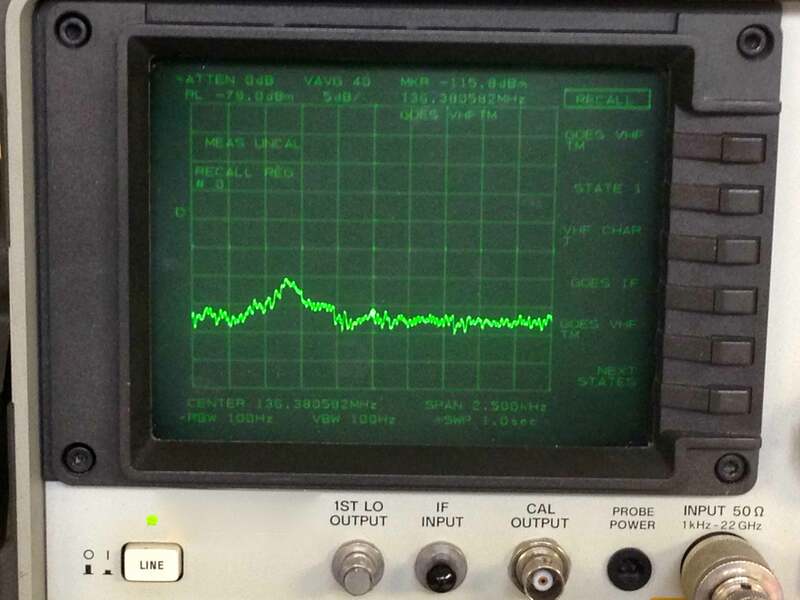 At left, the loss of GOES-3 VHF signal as monitored at the University of Miami (credit Hans Graber). The 38-year-old satellite had been used by USAP for 21 years, but was turned off because of its dwindling propellant supply. This image and other info...from this 19 July NSF press release, which also describes the official adoption of a DSCS-3 (Defense Satellite Communications System Phase III, vehicle B7 or DSCS III B7) satellite which provides access speeds of up to 30 MPBS, a bit of an upgrade from GOES' 1.5 MBPS. The DSCS satellite has now been incorporated into the various satellite visibility schedules including the one available here. 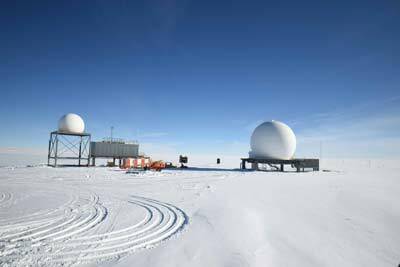 Here is a July 2016 Antarctic Report article about the history and decommissioning of GOES-3, and a Lockheed-Martin press release about the replacement of GOES-3 with DSCS III. Five Polies construct a large igloo in front of the station...and spend the night in "relative" comfort (8 August). A five-man team spearheaded by UT Josh Neff set out to create this igloo, figuring they'd finish it over the two-day weekend at the end of July. But as with most other stuff, weather caused delays. The folks eventually finished it in time to sleep (reportedly) overnight in it on 8 August. 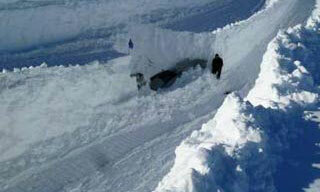 A few other folks would do so in the next few days before it was demo'd due to fears of snow drifting. 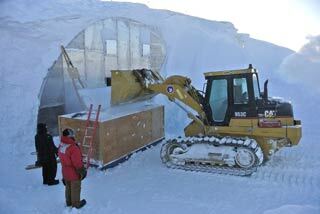 Reportedly this was only the second igloo completed (and slept in) during the winter months. Details and photos here. Power plant PLC failure causes multiple power outages and promises more for the rest of the winter (the particular device that failed is the one that allows for automatic transfer between generators when one is shut down for maintenance or failure). Apparently the remaining software doesn't give an option for the old-style generator paralleling using those light bulbs. 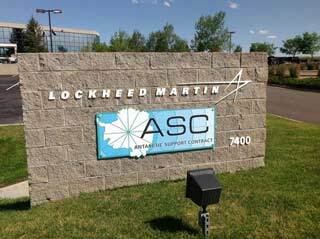 Leidos takes over the Antarctic Support Contract from Lockheed-Martin (16 August). This was due to a "Reverse Morris Trust" arrangement--a way for L-M to recover cash (potentially $8 billion) to pay for their acquisition of Sikorsky, and to offset their loss of the long range bomber program to Grumman. 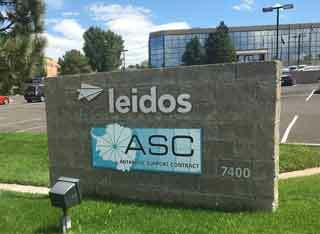 Needless to say, the USAP contract was NOT the key piece of L-M's business that Leidos wanted. My August 2017 photo at left shows the new sign in front of the project headquarters building. My full coverage, including an attempt to demystify the financial details as well as info about jobs begins here. 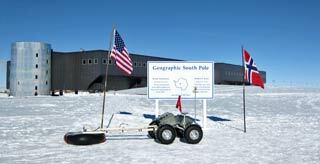 US Secretary of State John Kerry visits McMurdo (11-12 November). Interestingly, Kerry arrived in Christchurch on Wednesday 9 November 2016, as the US election results were becoming known. He spent 2 nights in Christchurch, meeting with the New Zealand foreign minister and visiting the CDC on Thursday before flying south on Friday. At left, Secretary Kerry is being introduced to the crowd in Building 155 by Kelly Falkner, NSF's polar programs director. Kerry had been scheduled to visit Pole immediately after his McM arrival, but that flight was cancelled due to weather. He returned to Christchurch on Saturday 12 November and continued to Wellington to meet the Prime Minister and American Embassy staff. More information and photos are here. 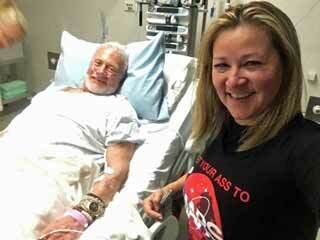 Buzz Aldrin...second man to walk on the Moon, medevaced from Pole (1 December). Buzz Aldrin, the second person to walk on the Moon in July 1969, was on a planned 8-day nongovernmental Antarctic visit out of Cape Town, operated by White Desert. On 1 December, he and his group were flown to Pole for a brief tourist visit...while there Buzz started to feel the effects of the altitude. After a visit with the medical staff and consultation with NSF, the decision was made to medevac him with program aircraft. By Friday morning he was in the Christchurch hospital (seen at left with his manager). The full story. Old buildings demolished or moved. Here is the only remaining construction trades shop Jamesway that didn't get torn down--the sheet metal shop (more photos). Not because of sentimental value...but rather because there wasn't an obvious place to store or move all of the sheet metal equipment inside--there was no room for it inside the former summer camp nonsmoking lounge which was converted into the new carpenter shop. 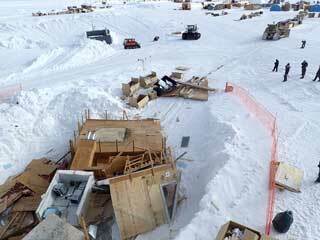 And nearby, the old rodwell building and waste barn Polar Haven were dug out and moved off to storage elsewhere. 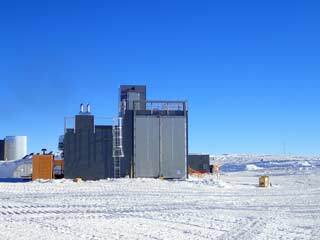 "Cosmic Dust Sucker" project (more correctly named as "Sampling Comet Dust from Antarctic Air") installed near on the edge of the clean air sector 250 feet from ARO. This was not the first air sampling project to happen here. NOAA has been sampling air into flasks and filters, well, almost since IGY...and other projects have looked for special stuff such as remnants of nuclear testing, the contents of air sucked from the bottom of firn drill holes, etc. Anyway, the principal investigator of this project (O-399-S) is Susan Taylor of CRREL, and the goal is to find dust grains which happen to be micrometeorites, perhaps from comets, by sucking air through a 3-micron filter. 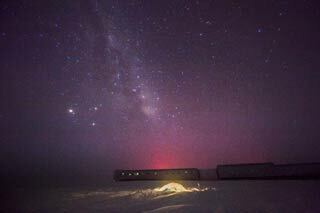 More info here in this Antarctic Sun article. The photo at left is by Michael Lucibella from the Antarctic Photo Library (link to original). 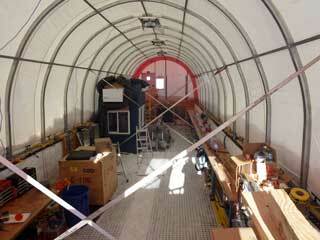 Conversion of a cryo building bay into the new balloon inflation facility completed. The facility had been in use for the past year, but lacked some finish work including interior drywall and wall covering, and finishing the exterior blue siding...all of which was completed this season (more information and pictures). 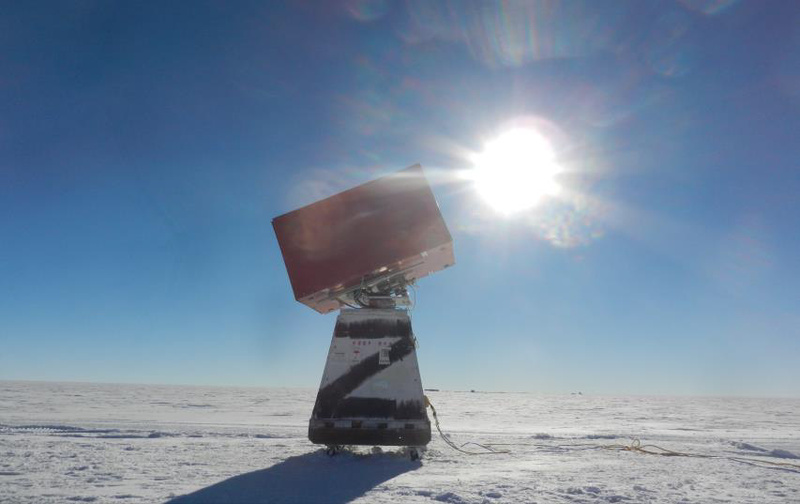 "Third generation" system installed in the South Pole Telescope. The massive project required 28 researchers working all summer, not to mention the earlier stateside efforts to fabricate the pieces as well as the station folks who were called on occasionally to assist. Oversimply, it's a big camera--8 feet long, weighing 2,500 lbs., and operating a fraction of a degree above absolute zero. This upgrade, known as SPT-3G, took known as SPT-3G, but this upgrade took it from 1,600 to 16,000 detectors. 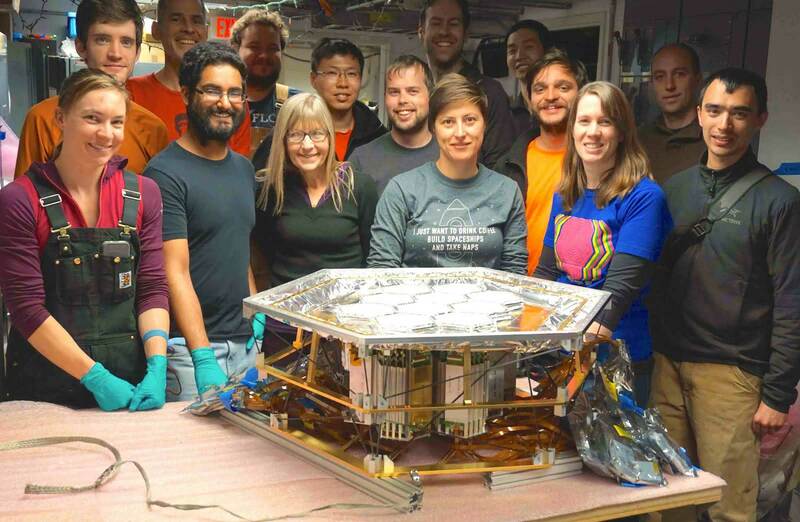 More details in this 23 March Chicago Maroon article interviewing professor Brad Benson, including his photo of the telescope at left as well as this photo of the team with the new microwave detectors. One of the new SPT missions was to be as a part of the Event Horizon Telescope for 10 days in April 2017...described in this NSF press statement and this 7 April PBS NewsHour report. Manager: Wayne White; population 46 (list and photos). 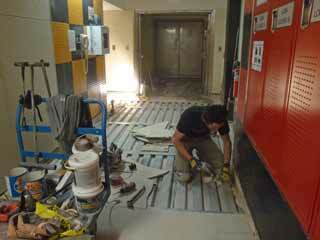 ...a continuation of the hallway subfloor replacement, as seen at left. This as well as the other projects have been a bit disruptive to station life...but at least this FCB doesn't produce anywhere near as much dust as all of the drywall cutting that happened during my 2005 winter. Photos and info. Amateur radio exam results in 11 new or upgraded HAM licenses (4 August). Now it is a hobby, but in the old days amateur radio was the only way to talk to folks at home. 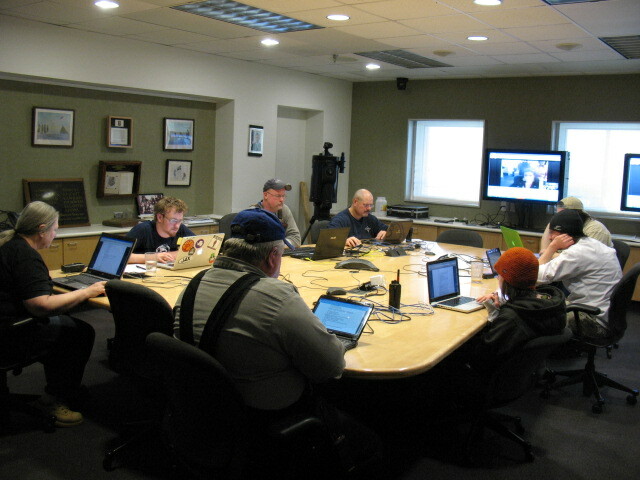 This isn't the first time that the ARRL has conducted remote exams at Pole (the first was during the 2010 winter)...but this was the largest such exam that ARRL has conducted. IceCube wo James Casey conducted a class...but the actual exam had to wait until the DSCS satellite was back up, so that two additional volunteer examiners could monitor the exam via Skype. The result...two new Extra licenses, three General tickets, and six Technician licenses. All pictured in this photo. James Casey is at far left. The photo is by Martin Wolf. 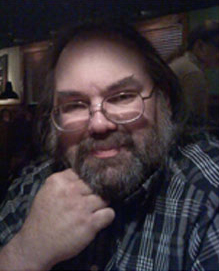 Here's James' blog post as well as the ARRL article. Carpet in the galley replaced at the end of the winter (photos). 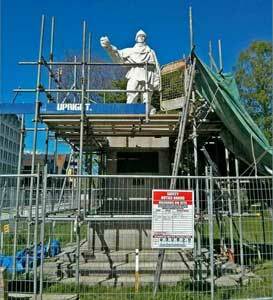 Christchurch statue of Robert Falcon Scott restored, reinstated (6 October). The statue, originally carved by Scott's wife Kathleen, has stood at the corner of Worcester Boulevard and Oxford Terrace...until the 22 February 2011 earthquake. Five years later, after extensive study and research, the statue was reinstated in a formal ceremony in the presence of the Christchurch mayor, the NZ Antarctic Society, and members of Scott's family...just in time for the annual wreath-laying on Sunday 8 October. The wreath-laying ceremony at the beginning of the Antarctic support season is a tradition started by RADM Richard E. Byrd in the 1930s. More about the statue and the repair/restoration effort is here. Dr. Stuart Jefferies returns for another summer of the Solar Observatory. The plans this season were to spend 10 days setting up before observing for 7 weeks...but it turned out the other way around, as the observations did not start until mid-January, shortly after this photo was taken of the instrument in test mode (photo (with Sun!) by Neal Scheibe). Here are photos of the site in 2016-17; this year the similar setup had to be repeated--digging a trench, burying the "smurf hut," creating a mound, and setting the instrument on top, inside a sun/snow fence, 3 miles from the station. Is the instrument a "telescope?" Not quite, as it is actually measuring solar gravity waves. Here's a good video and information page about the project from WXIA-TV in Atlanta. New shelter installed to improve DSCS satellite connectivity. This is located next to what was originally known as the MARISAT/GOES antenna...but that 9-meter dish has been inactive ever since the last of those two satellites, GOES-3, was decommissioned in June 2016. The new equipment will allow the large terminal to access that DSCS-3 satellite, which until now has been accessed using a 2.4-meter antenna housed inside the large radome. This smaller antenna will be repurposed as a backup antenna for the DSCS-3 B7 satellite. A couple more photos of the project and more information...here. Major NASA science traverse covers 466 miles to and along the 88ºS parallel. This was to establish precise ice shelf elevations below the planned orbit for the upcoming ICESat-2 satellite, using sophisticated GPS gear. The 4-person team included NASA glaciologists Kelly Brunt (PI) and Tom Neumann, with mountaineer/medic Forrest McCarthy, and mechanic Chad Seay. They drove two Pisten Bullys (Chad's photo at left) towing plastic sleds similar to those used by the South Pole Traverse...so the living and equipment tents did not have to be set up and stowed each day. 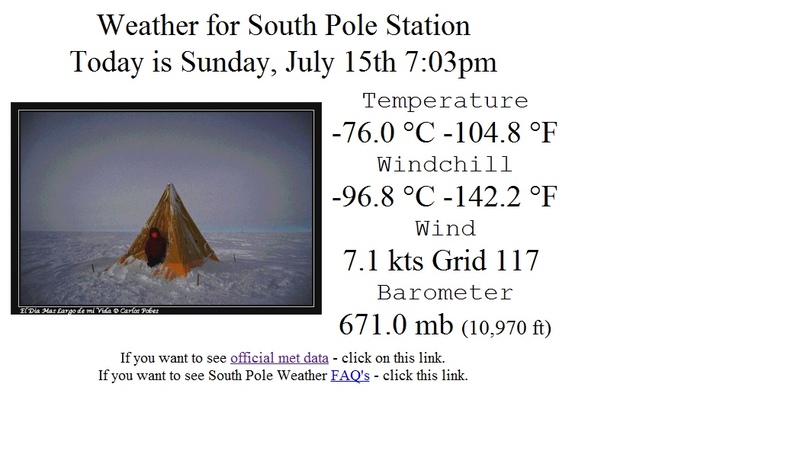 More photos/info from their blog as well as this NASA news feature, an Antarctic Sun article, and this NASA YouTube video. NASA's Operation IceBridge also overflew the traverse route. Three more traverses by the team are planned. Manager: Marco Tortonese; population 40 (list and photos). 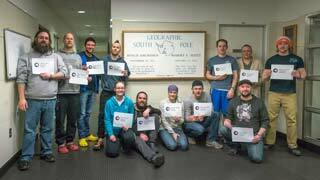 FIVE 2017 Polies head to Palmer station for the winter! This may or may not be a first, but in late March, these five 2017 winterover Polies were headed across the Drake Passage for the 2018 winter at Palmer Station. 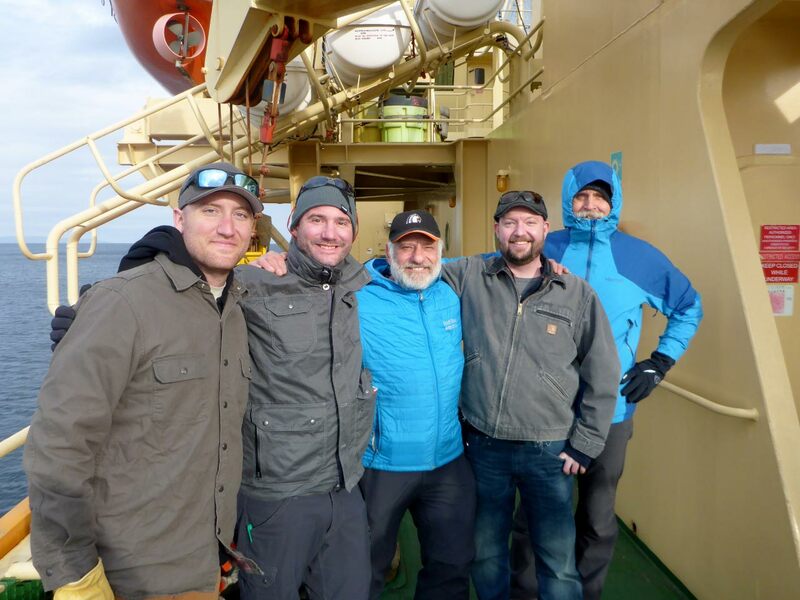 Seen here aboard the Laurence M. Gould are (from left) Steven Ashton, cargo; Josh Neff, maintenance specialist; Rick Osburn, carpenter; Eric Hansen, PM coordinator; Mike Rice, communications engineer. There trip south was not entirely uneventful--the vessel was diverted to Ushuaia after one of the people aboard required serious medical treatment (that person was later evacuated to the US and was doing well). 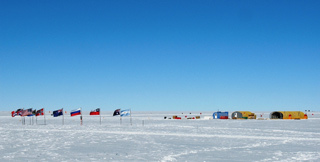 The ship reached Palmer Station at the end of March. This photo is courtesy Mike Rice, thanks! 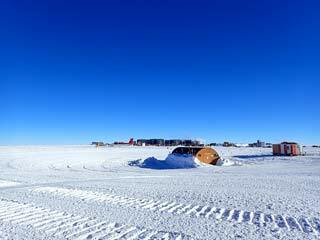 A high-energy neutrino tracked by IceCube is major science news. Actually, the graphic at left (from this IceCube press release) is not only out-of-scale, but also inaccurate, as the neutrinos that IceCube detects have passed through the Earth from the northern hemisphere. 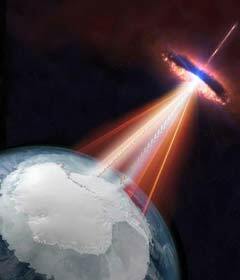 But it is good art...on 22 September 2017 IceCube detected a a flash of blue light which indicated a high-energy neutrino...they shared the data, and it was traced to a "blazar" in the area of Orion...a blazar is a giant galaxy with a massive black hole at its center. This is the most significant cosmological news to come from Pole in the past few years...lots of news and science coverage, too much to mention on this page, so check out the rest of the story here. Late winter construction project--A3 second level subfloor and flooring replaced. This was the third winter of the subfloor replacement project, as can be seen in the above photos from the 2016 and 2017 winters. In 2018 the project moved to the second level of A3 between medical and the bridge to B pod. 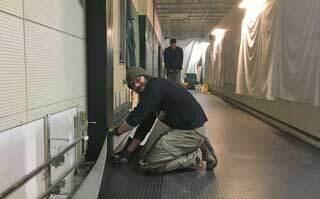 At left...carpenter Peter Gougeon and safety engineer Ted Violette finish applying the replacement vinyl floor surface. Note that the winterover photos are temporarily covered for protection. Here are a few more photos and credits. BICEP Array telescope mount structure assembled. 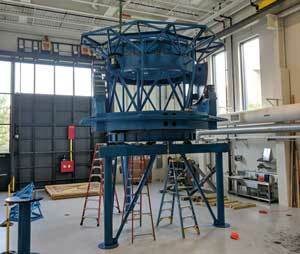 At left, the test assembly of the BICEP Array telescope mount structure at the University of Minnesota in Minneapolis. Work, including testing of the various rotation mechanisms, was continuing into 2019. In late summer the ~15 ton mount will be broken down into perhaps 10 pieces for shipment. This is for the fourth generation BICEP telescope--the first three (including BICEP3 still operating) were in DSL, but this will be installed on the SPUD/KECK telescope foundation next to MAPO in 2019-20, after Robert Schwarz watches the Keck Array telescope during his 2019 winter. This photo is one of many many on the BICEP Array blog, which features a number of characters including 2017 BICEP winterover Grant Hall, 2006 BICEP wo Denis Barkats, Ki Won Yoon, and project guy Mike Crumrine. More detailed info...two 2018 project papers, one describing the basic project, and another with more details about the telescope cryostat and mount design. After last season's installation of a module to the right of the large GOES radome, work is continuing, not only to fit out that module with equipment to better access Skynet, but also to move the current 2.4 meter DSCS dish (currently inside the large GOES radome) to the new radome seen to the left of the RF building. More information here, and stay tuned. Two deaths occur at the Mt. 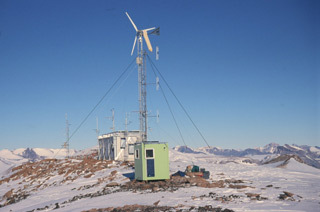 Newall repeater station in the Dry Valleys (12 December). 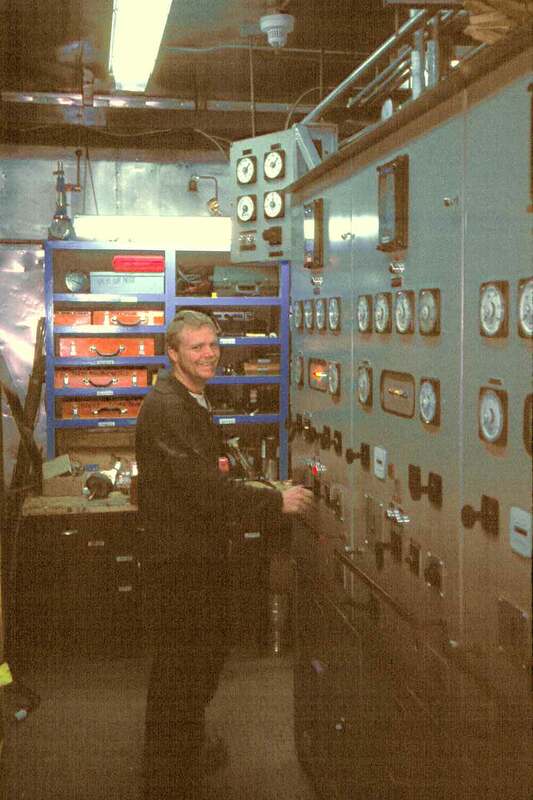 Two PAE fire technicians were working in the repeater/ generator building near the summit of Mt. Newall when a helicopter pilot sent to pick them up discovered that they were unconscious inside the building. 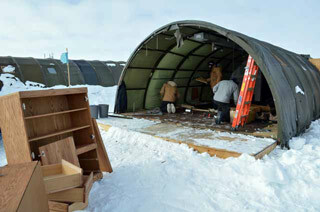 One of them was dead on the scene; the other was pronounced dead after arrival at the McMurdo medical clinic. The program and the contractor PAE have not provided much information and have not identified the two people...although friends and family have now released the names in obituaries. More details, including "where is Mt. Newall and what are we doing there?" can be found here. 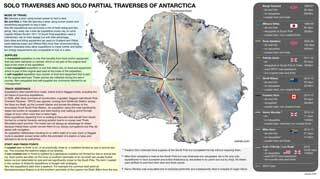 Antarctic crossings "complete" "unsupported" raise controversy. Other than nominally government-supported treks (Amundsen, Scott, Shackleton, Fuchs/Hillary, Crary), many NGO ventures have "crossed" Antarctica (or perhaps just traversed to Pole) quoting different rules and goals. Are the rules? The recent "race" between Colin O'Brady and Lou Rudd on a "solo unsupported unassisted crossing (of the Antarctic land mass)" (quoting Rudd) spurred much debate in media and among experienced Antarctic venturers such as Eric Philips, who shared the attached map in January. What gives? Many experienced climbers and polar trek veterans weighed in, so I'll mostly leave the discussion to them. Manager: Wayne White; population 42. 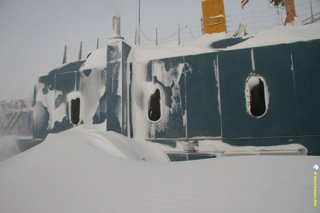 Congress approves major McMurdo remake along with significant funding (15 February). The AIMS project will remake most of McMurdo with state-of-the-art and more efficient facilities...one of the first of its projects is to be the VEOC, a replacement for the VMF aka "heavy shop." 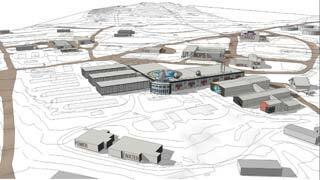 At left, a preliminary image of the VEOC. It's scheduled early so that it can be used by the contractors building the other new buildings while the existing VMF supports current operations. The rest of the AIMS story including updates on the pre-AIMS work already underway and links to more information and detail, is here.